I have been wanting a new pair of boat shoes for a couple of years now and every time I tell my wife I want to get a pair she rolls her eyes and says, “No way!” Apparently, she doesn’t want me looking any dorkier than I already am. 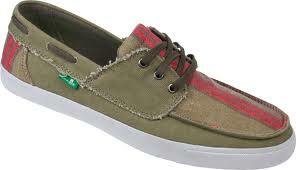 I decided to look for a shoe that was similar to a boat shoe, but is a bit “cooler” and trendier. So, I checked out the Sanuk website and came across the Sanuk Scurvy. Right away I liked how they looked. They looked like a boat shoe, but cooler! One problem I saw right away with Sanuks is that they only come in whole sizes. I wear an 11 ½, so I was a little worried about what size to get. I decided to go with a 12 and the fit is perfect! I got these shoes in early May and I have not stopped wearing them. They are simply awesome! When I told my wife what kind of shoe I got she was worried, but when she saw them she liked them right away. In fact, I have gotten more compliments with these shoes than any other shoe I have owned. Even the middle school kids I work with thought they were cool! One of the things I like about these shoes is that you don’t have to break them in at all! They come ready to wear and they look and feel great on your feet. The only problem I can think of with these shoes is that they make my feet a little smelly. My feet sweat a lot and I don’t wear socks with these shoes, so that might be why that happens. The surprising thing is that even though my feet might have an unpleasant odor the Sanuks do not stink at all. That is a HUGE plus in my book and I think they are pretty amazing. Overall, I love my Sanuks and I cannot wait to get another pair. I recommend Sanuks to everyone!